iPad Mini with 7.9-inch display will officially enter the tablet market on November 2. Apple's new tablet will compete in the 7-inch tablet market, with Android tablets like the Galaxy Tab and of course the Nexus 7. With the lowest price $329, the iPad Mini certainly a tempting offer by the end of this year. But what if compared to the Nexus 7 Android tablet made ​​by Google and ASUS? In terms of processor you can see Nexus 7 has been using a quad-core chip, while Apple is still using the dual-core A5 chip as used in the Apple iPad 2. Apple does not mention how much RAM the iPad Mini, while Google clearly mention 1GB of RAM inside the Nexus 7. Seen from the graph below, the screen resolution of the iPad Mini is under the Nexus 7. But there is one advantage the iPad Mini is quite interesting when compared to the Nexus 7. iPad Mini has been using technologies such as iSight Camera on the iPhone 5. The sensor is also quite tinggai camera (5MP) cameras such as the iPad 3, while not accompanied Nexus 7 rear camera, which means you can not take pictures using the Nexus 7, but utilizing a front camera for video chat. On the other side of the Google Nexus 7 also has another advantage, namely the offer price is much cheaper: $ 199. Google reportedly in the near future will also release a 3G Nexus price is not changed from the Wi-Fi only models. 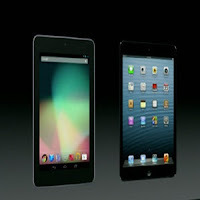 So, which one you choose; Apple iPad Mini Android tablet or Nexus 7? Although recently abandoned by their key executives, Zynga still trying to deliver the best for gaming fans loyal. The latest news comes directly from the official Zynga blog mention if they are preparing a sequel to the popular game CityVille. As disclosed in its official blog, this time Zynga has released CityVille 2 in the closed beta. While we can not tell you more details about the game, Zynga said if CityVille 2 will provide a rich experience of city building visually and socially. CityVille 2 will deliver all the features loved by fans combined with several innovations introduced on CastleVille and FarmVille 2, such as crafting and 3D graphics. Zynga is committed to bring something new and also listen to all the feedback users through groups, forums, play or beta test. How about you, are you also a fan of this game? Definitely can not wait to try it. If you need a game guide, see this blog continues. Brocade or lace fabric has become typical for the material used in the wedding dress. Although common, one of which is still chosen by the designer of the dress spring 2013 bridal collection them. Marchesa fashion house known for its stylish design, which uses a lot of lace material. For his latest collection, presented Marchesa strapless wedding dress with lace detail on the chest and back. For designers from Ethiopia, Amsale Aberra, lace fabric can not only be a beautiful detail on the dress. He even designed a whole dress made ​​of lace. Starting from the detail on the chest to the hemline (the lowest line on the end of fashion). Ballgown wedding dress will look more feminine with the addition of lace material on the chest to the arm. Make more ladylike appearance, Marchesa choose floral lace with a wide range of sizes. Not only brocade motifs relationship that can make brides look feminine appearance, sweet and romantic. Wave-patterned lace material is equally special and give the impression of a modern, such as the wedding dress works Brand Love, Yu. The technique of multiple exposure photographs style is not new, even be explored since the days of film. This technique is commonly used for two or more scenes of motion or stationary in a frame. The goal is nothing but images look more dramatic and dynamic. How to actually create a multiple exposure photograph with this? First, the necessary condition is a type of camera. It turned out that not all digital cameras have the facility or multiple exposure feature. If he did not have but would like to try it, though requiring digital means via computer software. Ie by combining multiple layers / layer are stacked into a single frame. For the record, this paper investigated a multiple exposure created in the internal camera, not on the computer. Second, make sure the lighting conditions to ensure the success of multiple exposure. Background images should be darker than the subject. This is to maintain the speed and the diaphragm is maintained when recording multiple scenes. Light falling on the subject also needs to be constant, not fickle. This need to keep the auto focus does not run and maintained lightmeter. Third, determine how many frames to be stacked in a single frame. Usually the camera provides 2 to 10 frames. More or less depending on the creativity of the recorded scene photographer. Fourth. Look carefully at what's going to made ​​multiple exposure. Adjust as needed because not all the scenes photos nice to be multiple. Here, reasoning and creative side of the photographer is very important in making a multiple photo. Fourth. Since the purpose of multiple exposures to create a more vivid and dramatic scenes, still pay attention to body language and expression of the subject who want taken of. Do not get them covered by a number of stacked layers. Fifth, multiple exposure capability train continuously and repeatedly. This exercise is necessary because the technique requires multiple and high taste.